On the afternoon of May 10, 2018 local time, Premier Li Keqiang met with principals of the opposition parties of Japan at the hotel where he stayed in Tokyo. Leader of Constitutional Democratic Party of Japan Yukio Edano, Co-leader of Democratic Party for the People Yuichiro Tamaki, Chairman of the Japanese Communist Party Kazuo Shii, Co-leader of Nippon Ishin no Kai Toranosuke Katayama, Leader of the Social Democratic Party Seiji Mataichi and others attended the meeting. Li Keqiang noted that China and Japan are unmovable neighbors. The two economies are highly complementary to each other with enormous cooperation potential. This year coincides with the 40th anniversary of the signing of the China-Japan Treaty of Peace and Friendship. We should review the spirit of the Treaty, and follow the principles set forth in the Treaty. Only by doing this can we rectify the route for the forward movement of China-Japan relations so as to ensure bilateral relations go forward along the right track. It is hoped that all the parties present at the meeting will make proactive efforts to advance healthy and steady development of China-Japan relations. 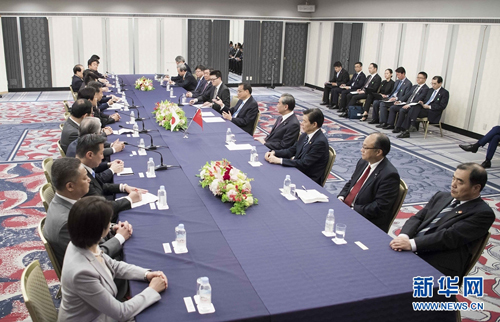 Principals of the opposition parties of Japan present at the meeting expressed that Japan-China relations are important to the peace, stability and economic development of East Asia and the world at large. The Japanese side praised Premier Li Keqiang's visit this time which has brought bilateral relations back to the right track and taken an important step in the direction of moving forward. It is hoped that both sides will take the 40th anniversary of the signing of the Japan-China Treaty of Peace and Friendship as an opportunity to carry out more extensive exchanges and cooperation between the two countries so as to enable the exchanges between political parties, members of the parliament and youths of the two countries to continuously make new contributions to the development of Japan-China relations.